I was inspired the other day after coming across these amazing looking biscuits in my Nana's latest NZ House & Garden magazine... they are refrigerator biscuits - I love refrigerator biscuits!!! My other Nana used to make almond refrigerator biscuits when I was young. The cool thing about them is that you store the log of biscuit dough in the fridge and cut off biscuits to cook when needed. 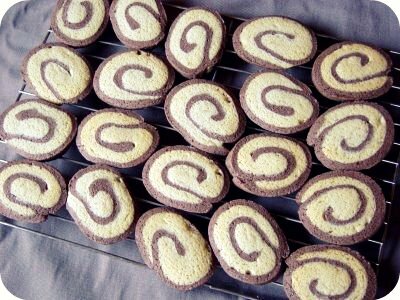 These pinwheel ones look really nice with the swirl from the two different flavours... even though the kids saw me making them (Miss 4 helped)... they were still amazed at how the biscuits looked when cut before baking. Cream the margarine and sugar very well until light and creamy. Add 3 teaspoons of water and beat very well. Add the vanilla essence and mix well. Sieve the flour and add to the mixture. Prepare a dough out of the mixture. Divide the dough into two equal partsand in one part, add the chocolate and cocoa mixture. Divide both the doughs into two equal parts. Roll out all the four parts into 6 mm thickness. 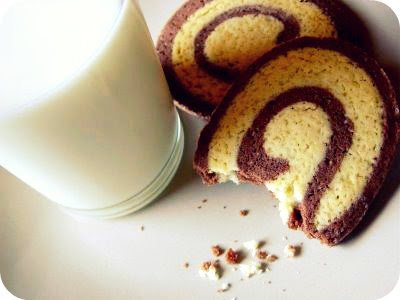 Place the chocolate parts on the white ones and then roll up like a Swiss roll. Cut into about 6 mm (1/4") thick slicesand press by hand. Grease a baking tin and arrange the biscuits leaving a little space between them. Bake the biscuits in a hot oven at 400°F (200°C). for 15 minutes. Leave the biscuits for some time until the pinwheels become hard. How much for two dozen... delivered... with the glass of milk?? Yummo! Do they bake hard? They look like the have the same consistency as biscotti?? I will give those a go .... and the fish tart too. We love smoked fish pie in this house - I make it at least once a fortnight. I used to use tinned smoked fish too and then found out that you can buy half a smoked fish from the counter at Pak'n' save and it costs about the same as the tinned stuff.... there you go, random facts! They actually were a little softer than I would have liked... I baked them longer than the recipe suggested... maybe next time I will try even longer... yummy though! Thanks for the smoked fish tip... will have to check out our Pak'n Save! Wow they do look impressive!